This has been “work your tail off” week. Our mission: To get The Rifter® #56, Robotech® New Generation™ Sourcebook, Rifts® Lemuria, Rifts® Vampires sourcebook and an updated 2011 Catalog all out by October. Heck, I’m hoping to have a Dead Reign™ Sourcebook out by October or November as well. After that, we’re hoping Rifts® Megaverse in Flames™, Rifts® Chaos Earth™: First Responders Sourcebook and another Robotech® Sourcebook will end the year (November and December) with a high note. Or so we are shooting for. That means we’ve been working like mad men to make it all happen. 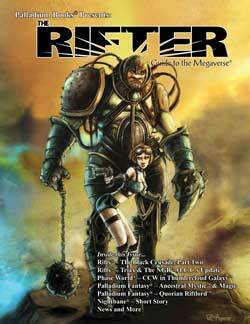 Even as you read this, Wayne Smith is working on The Rifter® #56 and a few other things. Matthew Clements has finished his work on the Rifts® Vampires Sourcebook (all it needs is my additions and final editing) and he is already fast at work on Rifts® Black Market. Alex and I are deep into the editing and tweaking of the Robotech® New Generation™ Sourcebook. Freelance writers and artists are working on a myriad number of projects and we are excited about upcoming releases as finished manuscripts are turned in. Megaversal Ambassadors Game Master support kits should post soon. Outstanding Game Master and author Carl Gleba has whipped up some tools to help Game Masters run Palladium game events as well as for use in their own games. They are things he uses himself – character sheets, other log sheets, hit locations, quick reference guides and much more. These G.M. kits will be made available for free to Megaversal Ambassadors, but will also be made available for a small fee on DriveThruRPG.com as PDFs for Palladium G.M.s and gamers who might also want to use these helpful Game Mastering aids. Each set of G.M. 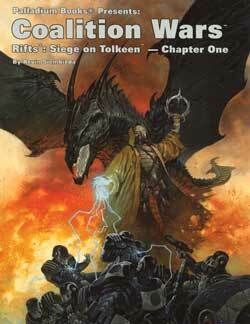 tools is game specific, the first of which is for Rifts® and the second for the Palladium Fantasy RPG®. Both should be available within a week. G.M. tools for other world settings are also coming. Megaversal Ambassadors are a growing number of Game Masters who volunteer to run Palladium gaming events at local conventions, stores and special events. It is all part of a grass roots effort to introduce new gamers to Palladium’s Megaverse® of role-playing games and the joy of role-playing. Zachary Houghton is the gent who came up with the idea for the Megaversal Ambassadors and we’re glad he’s back helping the program to move forward. James Brown is the other mover and shaker behind the program. If this is something you think you would like to participate in, please contact either of these guys and/or go to the Megaversal Ambassadors forum on the Palladium Website under “Community.” We encourage those of you who love to run games to contact the people running this volunteer force of super-gamers and spread the Palladium role-playing experience. Hey, convention organizers, you don’t have to be a Megaversal Ambassador to run Palladium events or get our support. All you have to do is contact us, prove you are a legitimate ongoing convention, talk to Alex and we’re happy to support your events in whatever way we can. As a rule, we look to support conventions running Palladium gaming events. Palladium welcomes conventions of all sizes, big, medium and small. Game on! UPDATE: Online sales continue to roll up and down along with the economy and stock markets. Sales have been less than stellar, though we continue to hear high praise for Rifts® Vampire Kingdoms™ and we know there is a lot of excitement about upcoming books (Robotech® New Generation Sourcebook, Rifts® Lemuria, Megaverse® in Flames™, Dead Reign™ sourcebook, etc.). Keep those orders and pre-orders coming in. New books are on their way. New T-shirts too. UPDATE: Robotech® New Generation™ Sourcebook. I’m about halfway through the manuscript and Irvin Jackson has knocked my socks off. I hope Harmony Gold is as pleased and impressed with it as I am. As for fans of Robotech® – I think you will love this book. 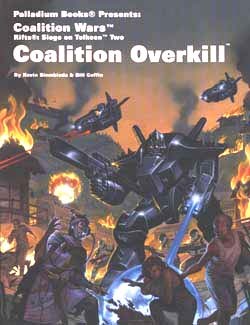 Freedom Fighters and other O.C.C.s add new flavor to the setting of the New Generation, as do mecha-chimeras or “Frankenmecha” – amalgamations of robots, combat vehicles and weapon systems, new gear, and lots and lots of fun source material and adventure ideas in an epic setting of survival and heroism. Join the fight to free Earth from the tyranny of the Invid. 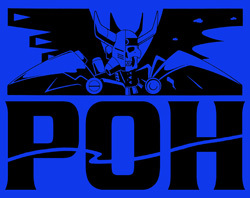 We are optimistic about releasing another Robotech® Sourcebook by December and another in February 2012. More on them in a few weeks. Manga size or not manga size? That is the question. And we want your opinion. Should we stay with the manga-size or make this book our usual size? The main problem with the manga-size format is that you cannot lay the book flat open, it automatically closes unless held open. Let us know what you think in our latest poll. And no, we cannot redo the manga-size books in the standard size until they are out of print. That would mean two different sizes of books in the Robotech® series. Share your thoughts with us. UPDATE: Rifts® Lemuria. 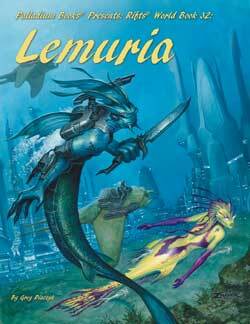 As soon as I’m done with Robotech® New Generation, I dive into finishing Lemuria. I’ve already done some work on the book and Matthew Clements has already gone over it for an initial edit. ALL the artwork is in and it is gorgeous. Amy Ashbaugh, Kent Burles, Nick Bradshaw, Mike Mumah and Chuck Walton knocked this one out of the park. 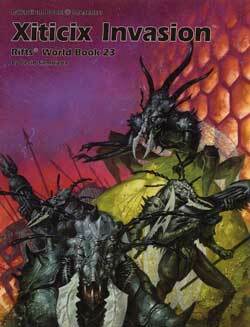 I am looking at a September release for this sourcebook. UPDATE: Rifts® Vampire Kingdoms™. Available now. Most fans of the original book and newcomers alike love it. Have you ordered yours? 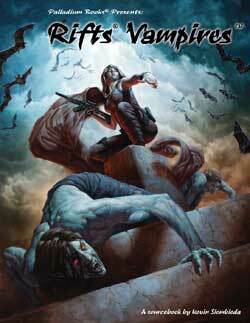 UPDATE: Rifts® Vampires Sourcebook. This book is three-quarters of the way finished. It picks up where Rifts® Vampire Kingdoms™ left off and is jam-packed with more source material that will leave you smiling and gasping at the same time. 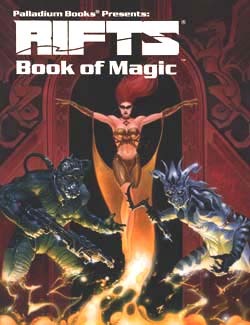 Rifts® Vampires Sourcebook is a 128 page book that includes Fort Reid, more Reid’s Rangers, Techno-Wizard weapons, the Yucatan, the Mayan god Camazotz, Werebeasts, desert survival and more. Shooting for a September release, but may slide into October. Watch for Sneak Previews of Rifts® Vampires Sourcebook™ and Lemuria as FREE PDFs from DriveThruRPG.com in the weeks to come. The Rifts® Vampire Kingdoms™ Sneak Preview is available now. Sneak Previews of Armageddon Unlimited™ and Rifts® Thundercloud Galaxy™ are also available. To get any of the free PDF downloads, go to DriveThruRPG.com. It is easy to create a free account and only takes a couple of minutes. 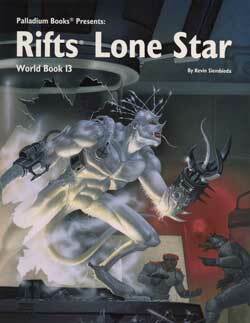 DriveThruRPG.com is a good resource for getting the Hades & Dyval Map Pack, The Rifter® Number Zero, The Rifter® #1-48 and to fill in your RPG library with first edition copies of Rifts®, Palladium Fantasy®, Heroes Unlimited™, and other game lines, as well as books such as Nightbane® Book Four: Shadows of Light™ and both versions of the The Mechanoids® RPG (1985) and The Collected Mechanoid Invasion® Trilogy (1981-1983). UPDATE: The Rifter® #56. More great optional material for Rifts® and the rest of the Megaverse® written by fans just like you. Cover by Irvin Jackson. October release. UPDATE: Rifts® Megaverse in Flames. All of us are pushing hard to make this a November or December release. UPDATE: Back in Print: Just a reminder that the following books are back in print and available now. UPDATE Alex. I’m happy to report that Alex seems to be doing much better. His red blood count is back to where it belongs and other numbers that need to come down are doing so. He’s been in better spirits and enjoying being back home. UPDATE Kevin’s Online Store. I’ve got Alex rebuilding my online store containing toys and collectibles from my personal collection. More on it next Weekly Update. UPDATE Convention Appearances. Convention news is located toward the end of the Weekly Update. There are some new convention updates and info and we need G.M.s to run games at the Palladium Open House and Gen Con 2012. Palladium’s next convention appearance is at the Detroit FanFare in September. UPDATE Palladium Open House – May 4,5, 6, 2012 (May 3 is VIP Night) Palladium gamers are excited about this fun event. Gamers come from around the world and now have a gentleman coming in from Japan as well as England, Europe and Canada. I hope as many Palladium fans can join us for this whirlwind weekend of fun as possible. We keep talking about it now because it is only nine months away and we want people to start saving now, so we can have a record number of attendees. This might be our last POH so we want to the event to go out with a blast. There are more details in the convention portion of this Update. Halloween Store – QueenofGhouls.com – This past week, Kathy Simmons has added two new killer clowns, a sinister circus ringmaster, and a chop shop nurse to her online store. A Mad Doctor, a new crawling zombie, more clowns and other scary, life sized Halloween props will be added soon. Halloween is only 67 days away, so Kathy Simmons wants to make sure there are enough “ghouls” for everyone. Her life-sized Halloween props include killer clowns, mad doctors, zombies, witches, wizards, executioners, werewolves and monsters. The Queen of Ghouls is something of a fun extension of Palladium Books because Kathy is a beloved staff member and I help her paint and tatter clothing for many of these unique Halloween decorations. If you are looking for a standout Halloween item for your front lawn, one of these will do the trick. And they look sooo much better than the photos. WARNING: Once you see one of Kathy’s ghouls in person and get rants and raves from everyone who visits your home on Halloween, you may find yourself buying a new one every year. Kathy has recently sold a couple of zombies, a scarecrow and a Christmas figure. Check out her Halloween store at QueenofGhouls.com. Her creations are durable and can be used year after year. Gamers have loved the ones we’ve had at the Palladium Open House and Gen Con – they are truly awesome. Halloween is just around the corner. A personal aside. In my opinion, Palladium Books has some of the greatest guys and gals working with us on the planet. In addition to the Palladium staff, there are ladies and gents like R.C. Aradio, Amy Ashbaugh, Brandon Aten, Rex Barkdoll, Thom Bartold, Carmen Bellaire, Chris Bourassa, Nick Bradshaw, Wayne Breaux, Kent Burles, Braden Campbell, Randi & Roger Cartier, Cheryl Corey, Mike Dubisch, Mark Dudley, Mark Evans, E.M. Gist, Carl Gleba, Jeff Hansen, Mike Hayes, Irvin Jackson, Scott Johnson, Renee Lane, Mike Leonard, Mike Majestic, Mike Mumah, Allen Manning, Brian Manning, Mark Oberle, Apollo Okamura, Ramon Perez, John Philpott, Jason Richards, Ben Rodriguez, Josh Sinsapaugh, Taylor White, Tyler Walpole, Chuck Walton, Mike Wilson, and John Zeleznik, among many others! By “the greatest,” I don’t just mean by way of talent and ability, but that they are great people. You know, outstanding people of high caliber and personal character. I am so proud to know these men and women. I’m happy to call many of them my friends, and it is an honor to work with them. With Labor Day coming up next week, I just wanted to thank the many people who work so hard to make Palladium products. They are a part of the imagination engine behind Palladium Books. They inspire and challenge me to do my best. They help to build the Palladium Megaverse® and join me in unleashing new realms of imagination and entertainment. My apologies to those I did not name specifically, please know you are as important and special as all the rest. My love and appreciation to you as well as the many wonderful people who have worked with me in the past, such as Erick Wujcik, my Dad, Kevin Long, Jeff Burke, Larry Elmore, Tony Falzon, Patrick Nowak, Keith Parkinson, Jeffery Russell, Timothy Truman, Steven Bissette, Richard Corben, Freddie Williams and many others. That’s all for now. I have new books to finish. Keep those imaginations burning bright and game on. 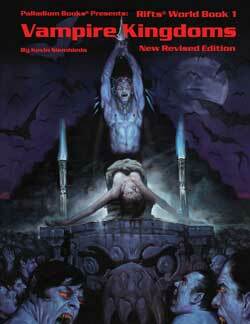 Rifts® Vampire Kingdoms™ is in our warehouse waiting for your order. Initial feedback has been overwhelmingly positive. Order yours today. 224 pages – $24.95 retail – Cat. No. 802-E. Available now. Order yours today. 160 pages – $20.95 retail – Cat. No. 885. Final page count and price may be subject to expansion and increase. September release. The Rifts® Vampires Sourcebook™ will expand upon old material from the original Vampire Kingdoms World Book as well as much completely new material. Trouble is stirring in the Vampire Kingdoms as ambitious vampire lords, ladies and misanthropes seek to expand their power to dominate more mortal life forms. This sourcebook will be every bit as exciting and packed with cool stuff as Rifts® Vampire Kingdoms™. Vampires and Werebeasts of the Yucatan. Vampire Hunter “exterminators.” Mortal assassins who serve the vampires by hunting and destroying Vampire Hunters and other enemies of the Vampire Kingdoms. A setting in which Battloids, Veritechs, power armor and technology from all eras of Robotech can come together. O.C.C.s include the Freedom Fighter, Patcher, Urchin, Pathfinder, Invid Protoculture Experiment and more. The Resistance and how it works. Adventure and adventure ideas galore. A “manga” size sourcebook. Or should it be our normal size? Let us know. 192 pages – $16.95 retail – Cat. No. 554. Final page count, format and price may be subject to change. October 2011 release. Note: With any luck, there will be a companion Robotech® sourcebook released by the end of the year. 192 pages – $24.95 retail – Cat. No. 876. October release. 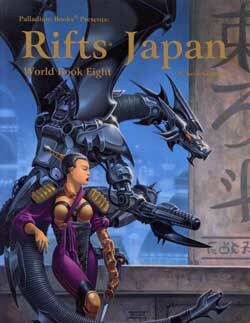 - Rifts® World Book 1: Vampire Kingdoms™ – New – Available now! We’ve gotten confirmation of our end cap and are looking forward to seeing gamers and comic fans from Michigan, Ohio and the surrounding area come on down. The event is the Detroit FanFare, September 24 & 25 at Cobo Hall, downtown Detroit. One of the guests is Kevin Eastman – co-creator of the Teenage Mutant Ninja Turtles®. So this fun comic book and media convention will be a great chance to get your Ninja Turtles® game books (and comics) signed by one of the creators. Other guests include fan boy favorite actor, Bruce Campbell, and dozens and dozens of comic book guests. Palladium fans may be interested to know Dave Dorman (Palladium cover artist), Tim Bradstreet, and pal, Defiler and Palladium contributor of old, William Messner Loebs will also be attending, among many other guests. I’ll keep you posted as we firm up the details. 1. Palladium Books will be at Gen Con Indy 2012. 2. We need Game Masters to run Palladium game events. We want Palladium Books to be a much bigger part of the gaming experience at Gen Con Indy in 2012. Toward that end, we’re hoping a number of Game Masters will step forward and run “official” gaming events at Gen Con. To do that we need your help. Let us know if you are planning to run at Gen Con Indy 2012, but most importantly, YOU NEED to contact Gen Con directly and fill out whatever Event Submission form/application and send it in to them BEFORE THE JANUARY DEADLINE. This can all be done online. Note: Though there are different “rounds” and deadlines for submitting events, it is our experience that submitting in time for the very first deadline is the only way to sure-fire guarantee the event will to be included. So please, let’s plan now and get our events entered in the first round, mid-January 2012. Megaversal Ambassadors, please be a vocal and visible part of getting people to run Palladium gaming events for Gen Con Indy 2012. Any and all game settings (Rifts®, Heroes Unlimited, Palladium Fantasy®, Robotech®, Dead Reign™, Nightbane®, Splicers®, Robotech®, BTS, and all the rest) are welcomed. Let’s make the halls of Gen Con Indy 2012 ring with Palladium gaming. The Palladium Open House is three days (four with VIP night) of non-stop role-playing gaming, a chance to meet and hang with the Palladium staff, artists and writers, participate in panel talks, get autographs, and have a blast. Game with the people who make the games at the very place they are designed. YOU are part of Palladium’s extended family, and we invite YOU into our home to join us for gaming, fun and more. The Palladium Open House has a fun, family feel and is three days (four with VIP night) of games, fun and opportunity for making wonderful memories that will last a lifetime. ● 40+ Palladium creators under one roof. ● Game with the people who make the games you love, like Kevin Siembieda, Julius Rosenstein, Carl Gleba, and other Palladium creators. ● Enter the Costume Contest and you might win a cool award and prize. ● Enjoy panel talks that are fun and insightful. ● Get autographs and chat with creators. ● What other game company invites you to game with them at their place? ● We are hosting this event because YOU demanded it. So come on over and join the fun. We recommend you RESERVE your hotel now. Your credit card is not charged until the event, but reserving your room early gives you peace of mind and helps Palladium so we can block more rooms if we need them. If necessary, you can cancel your room up to a few weeks before the event. This may be our last Open House. Having sufficient parking is becoming an issue. While we should be okay for the 2012 POH, the parking situation is likely to prevent future events. So don’t miss out. Individual Day Admission might work better for you. If you can only make it one day, that’s okay with us. Come on down. Hotel is the location you love at the same 2009 rates ($69.95 a night). The hotel does not charge your card until a day before the event, so reserve NOW. We are concerned they might run out of rooms at our special price, so reserve your room as soon as possible. Based on the economy, the hotel has not reserved the entire hotel for us as they have in the past. Book your room fast so you know you have a place to stay. The hotel now offers free hot breakfasts and we will have two conference rooms for late night gaming and additional open gaming. Game Masters wanted for 2012 Palladium Open House (POH). The sooner you notify us that you are running “official” POH games and how many games/time slots, the better. We want to get our gaming schedule up and posted online early this time. We typically need 90+ gaming events. That means we need you. FYI: You can run the same game more than once, I do. Palladium is in need of Game Masters to run events at the 2012 Palladium Open House. G.M.s who run three or more events get a special discount on product and a gift (typically a T-shirt, but maybe something different this year). Palladium NEEDS your commitment to run and a description of the games no later than January 29, 2012 – SOONER IS BETTER. Our thanks to those of you who have already committed to run. Please let us know what you want to run. Julius Rosenstein already has 7 events scheduled. Be like Julius and let us know as soon as possible. Thank you.